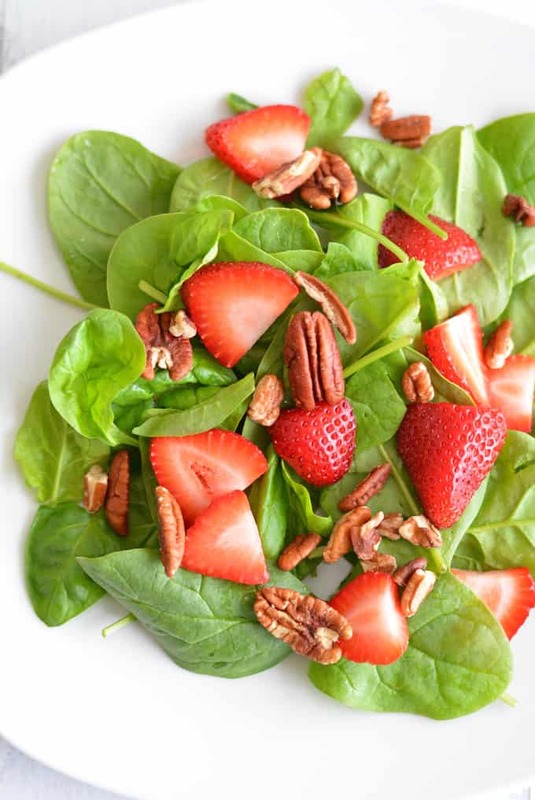 Sweet Strawberries and savory spinach are a perfect match for this refreshing salad. Years ago I was introduced for the first time to a strawberry spinach salad that a guest brought to my in-laws home for Easter dinner. The salad was delicious. I snagged the recipe and proceeded to make the salad a lot that year. I made the salad so much I couldn’t stand it any longer. Have you ever made a recipe so much that just could not make it or eat it anymore? I have not made that recipe for years, likely 14 years. There is a lot of sugar in the recipe, which of course makes it so yummy. However there is just too much sugar! I think about the recipe every once in while, because it really was a great salad. I finally decided to dig the recipe out of the recipe book and try it again after all these years. Altering the recipe to decrease the sugar a ton was a must. The original recipe that inspired this recipe used about a cup of sugar in the dressing and sugar coated nuts. See what I mean? WAY TOO MUCH SUGAR! I took out most of the sugar. The nuts are not coated with sugar and the dressing just has a smidgen of sugar from maple syrup. 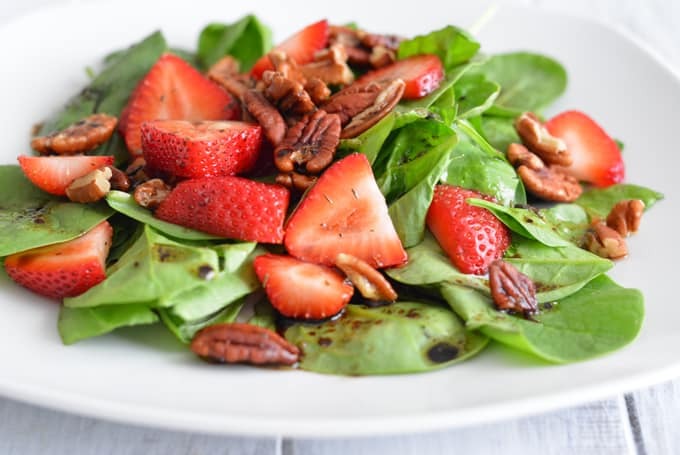 This Strawberry Spinach Salad with Maple Balsamic Dressing is a perfect blend of tastes and textures. It’s pretty to look at too! The recipe is for 2 servings. You can make larger quantities, but I find that making too much will just lead to waste. Spinach does not hold up well once you add the dressing. I don’t know about you, but I don’t like mushy spinach! 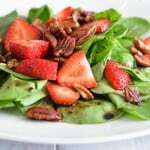 Divide spinach, strawberries, and pecans among two large plates or bowls. In a small bowl whisk together olive oil, balsamic vinegar, maple syrup, and seasonings. Gorgeous and simple. I love it! Well I love the sound of this healthy version more 😉 Yum! It is a really pretty salad! It still looks like a sweet salad without all the added sugar. I have a recipe that uses sugar-coated nuts too, and I don’t think it’s critical to have the extra sugar in there. 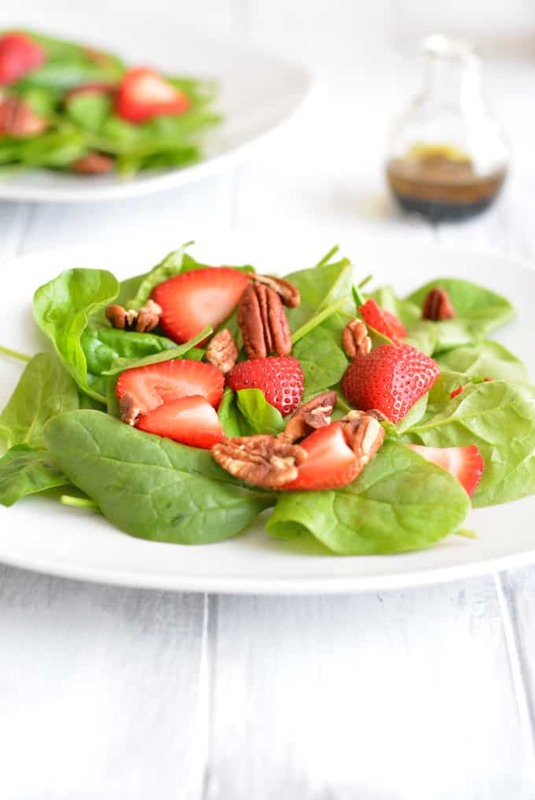 Such a pretty salad and spinach and strawberries are such a great combo – both taste-wise and nutritionally! Def don’t need more sugar than what you have – the strawberries are sweet on their own!